Should I be concerned for Viruses when I download through Steam? I suspended the download of this game until I could confirm if the game is safe. I know that sometimes Anti-Virus might give false positives when an innocent file does something similar to a known Virus, but when it comes to PC safety, I can't always give the benefit of the doubt. I am wondering however, should I be concerned for Viruses when I download through Steam? Or is this just a known false positive and downloading through Steam is actually safe? win32.BogEnt is a known false positive for digital download games. It should be fine to play this. win32.BogEnt is a heuristic-based indicator. This is not based on the scanned file being known to the software as a virus, but rather the software doing some analysis on the file and deciding that it MIGHT be a virus based on stuff like it sharing certain code fragments with a virus, or it might use rarely used instructions, or it might be run in a contained sandbox environment to see what it does. Heuristics frequently give false positives. The overwhelming majority of games on Steam are pretty safe to download, especially if they're already on there for a couple of months. However, some games get bundled with invasive DRM, although that's not really a virus. I suppose you can never be too safe, but you shouldn't really be concerned for viruses on Steam. [susp] in the virus' name stands for "suspicious", which means the anti-virus itself isn't sure if it's even a threat or not. Games downloaded on Steam are (supposed to be) virus-free. I'm fairly sure that's a false positive, if I'm not mistaken it's the dll for Gog's Galaxy client. Earthlock is available on Gog and has Galaxy support so it's reasonable to assume that's what it is. The Steam.dll gets included in quite a lot of Gog's DRM free games too so I imagine the developers just use the same builds for both in many cases. As has already been mentioned many games and game clients get flagged as viruses or malware by over enthusiastic anti virus. There are many files that act in ways that certain antivirus programs see as problematic. For me personally, I had an issue with Sid Meier's Civilization V where the .exe would get quarantined by Symantec. 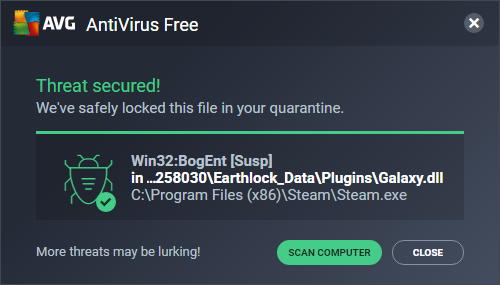 Steam is usually pretty good with keeping viruses from getting into their downloads and keeping them out of their network. I'd say not to expect any viruses from a Steam download. One important thing to remember about Steam is that it has a very large user base. That equates to a very large number of people available to report 'this game has a virus'. It's true that there are other factors that affect this (the virus may only target certain users, people might not report the virus, the game may not have been bought by many people etc) but on the whole, if there's a lot of satisfied customers then it seems likely that these people have not experienced viruses and thus unlikely that the game does contain a virus. That said, there are some games with 3rd party anti-cheat systems that are somewhat invasive and questionable (I remember one game in particular used an anti-cheat system that required a Windows service to be installed). The original question was "Should I be concerned for Viruses when I download through Steam?" I believe the correct answer is to ALWAYS be concerned when downloading ANY software from ANY source. Always assume the download could contain a virus (whether intentional or not). Now, that being said... Steam is a very popular platform for a large community of gamers and I am certain they would do as much as they can to properly vet new games and their developers. But there's only so much they can do and, ultimately, the responsibility of securing your machine is yours alone. When something suspicious pops up, it's your duty to research it before allowing it onto your machine. You've done the right thing. You've asked for help. You can also Google the "virus" that is flagged and see what it might be. Just be aware that because something SAYS it is one thing, doesn't mean it actually is. A flag that turns out to be a "false positive" on your search could actually be a true virus that is just named after what is now commonly assumed to be a false positive. Crafty little buggers, aren't they? Not the answer you're looking for? Browse other questions tagged steam earthlock or ask your own question. Steam game download messed up! Will steam download games when computer is sleeping? What does it mean when a Steam download says Preallocating?